Did you know that you can create one of the most effective homemade body scrubs (that can even reduce cellulite), using only two ingredients that you probably already have? A wham-bam combination of the ever-popular coconut oil and ground coffee is one of my favorite and unconventional ways to treat myself to glowing and radiant skin. This glorious self-made concoction actually works, and it’s cheap too. Why coffee? Glad you asked. Caffeine is considered the best ingredient to fight cellulite by stimulating blood flow, and toning and tightening the skin. Coffee is also rich in antioxidants, which aids in releasing toxins… well, hello detox! If you really want to reduce your cellulite, you have to be extremely diligent, scrubbing your skin at least two to three times a week. Combine your treatments with exercise, better diet and h2o, and you will see a difference. For those of you who aren’t plagued with cellulite issues (lucky you! ), then look at this homemade body scrub as a way to treat yourself to the silkiest skin ever. I use Cocovit Coconut Oil and ground Stumptown Coffee beans. Step into the shower or bath and before turning on the water, combine a small scoop (about 2 tablespoons) of coconut oil with a large scoop (about 1/2 cup) of coffee grounds until the grounds are completely soaked with the oil. Rub the scrub onto your dry skin. You’ll want this scrub to be exfoliator-heavy, so if it’s feeling too watery, add more coffee. Firmly rub your whole body head to toe, focusing on those rough spots like the back of your arms, elbows, knees and feet. To target that stubborn cellulite, firmly rub the scrub into the affected areas using circular motions. Continue for at least five minutes on each area. Sit down in the shower and wait. I like to wait at least ten minutes. You can even get a little wild and combine it with a power face or hair mask. So you don’t die of boredom, rinse and dry your hands, grab your phone and scroll through Instagram or check your email. Do whatever makes you happy! After you wait ten minutes, rinse, dry and apply your favorite lotion or oil – I like Tata Harpers’ Body Oil – head to toe, and voilà! Smoothest skin ever. Share the post "She’s In The Glow: DIY Coconut Coffee Body Scrub"
This sounds amazing, I can’t wait to try it! Just one question: I’ve always shied away from exfoliating at home because I’m afraid that it will make my shower so slippery (coconut oil, olive oil, etc. ), and then I’ll have a big clean-up on my hands! Any suggestions? Thanks! Can this be mixed and stored in a container? @Samantha, for the slip factor, you can lay a “ready to go in the wash” towel or sheet down in the shower/tub. It’ll help absorb the oils and keep you from falling. Then, toss the towel into the wash on the “heavy soil” cycle! @Chalkboard, do dry, already brewed coffee grounds work too? I think my guy would freak if I used fresh grounds that would have been destined for a nice cuppa coffee….. Thank you! I can’t wait to try it. Good idea regarding the towel! 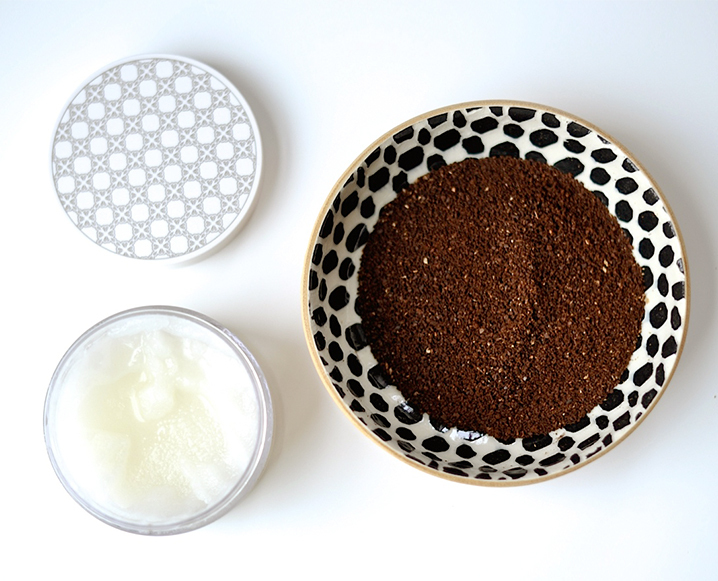 I’ve been dying to try a coffee scrub…this will definitely do! Thank you! Do you have a link to the studies supporting the claim that this type of scrub can reduce cellulite? I feel like that is attached as a buzz phrase to so many things, but no one ever links evidence or factual studies supporting the claim. I’d love to know where you get your information. Thanks! Cellulite occurs when underlying fat deposits begin to push through layers of collagen fibers, or connective tissue, under the skin, once it’s there you cannot get rid of it. You might want to rephrase this piece so you aren’t misleading people. I’m sure this is a nice scrub though.